And, that's a wrap! Another successful Barth conference. Clifford Anderson and his team of mis-fit conference organizers (who did a great job, despite being misfits!) have done it again, and deserve our thanks. Next year's theme will be Barth and Mission. In terms of this morning's activities, Boulton's presentation this morning was especially well done, and provocative in its own way. I am looking forward to reading his book (mentioned in the previous post) sometime later this summer. Perhaps Darren will provide some comments on his talk. The closing pannel discussion unfortunately produced no real fireworks, but it did provide a context for the various speakers to address each other (and be addressed by the conference attendance as a whole) and find some common ground. The last day of the conference is upon us. I dropped the ball yesterday in terms of substantive coverage, at least for the most part. Luckily for all of us, Darren as a coupleof posts` up covering such things. One thing that Darren wasn’t able to cover was Mark Lindsay’s talk last evening. I was there, but I was in charge of audio recording the talk and so did not take notes. But, here are a few recollections. In lieu of another substantive update today, here are some picture that I took this morning after Katherine Sonderegger's session. Time for a rousing game of "Name That Theologian!" It will be a little tricky because some of the shots are from behind or the side, etc. But, let's see what you - the collective readership of DET - can do! I'll tell you when you are right or wrong, or if no one really participates, I'll give out the answers in a week or so. Name tags may help you some if you zoom in. I missed Katherine Sonderegger’s session this morning because I was at my son’s 9-month doctor visit, but it must have been good since the Q & A went about 15 minutes over the allotted time. So, her paper will be something in particular to look forward to when the volume from this conference finally hits the shelves. The second session this morning was by Richard Fox Young, a professor of the history of religions here at Princeton Theological Seminary, and opened with some personal reflections on his early interaction with Barth’s thought. Some of this reflection centered on Young’s time in India, where an Irish Presbyterian rekindled his interest in Barth. In general, Young seems to see some development in Barth on the topic of religion, contrasting what Barth had to say in §17 with some later statements in Barth’s Gesprache (part of the Gesamtausgabe). For a fuller account you will, as with Sonderegger, want to consult the published volume when it becomes available. The after-dinner talk on day 2 of the conference has concluded. It was delivered by Charles West, an emeritus professor here at PTS, and was entitled, “Barth, Bonhoeffer, and Kraemer on Religion.” He took as his main task comparing the polemical answers of these three figures to the 20th century question, “What is religion?” This is to be contrasted to the 21st century question of, “How do we engage with the myriad of religious expressions that surround us?” Although his commentary on these thinkers was insightful and thought provoking, I will not go into detail on that portion (read: I was too busy listening to take notes!). Here are some of the payoff points. So, we are in day 2 of this year's PTS Barth conference. Day 1 was given over to registration, an opening banquet, and Clifford Anderson's brief opening remarks. Day 2 is still in via, but so far we have had a very interesting presentation from Gerrett Green on, among other things, some bits of the material that Barth excised from CD 3.1 before publication. Next came Ben Myers speaking on nature and paganism. I have it on good authority that Ben didn't finish his presentation until shortly before he gave it, although those hearing it would never have known this. One great line that stood out to this author was as follows: "Nature may sound eloquent, but she speaks with a forked tongue." 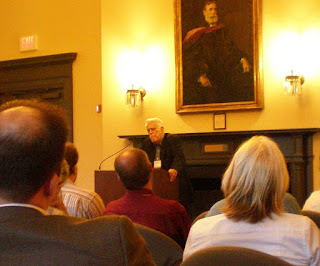 The 2009 PTS Barth Conference is starting tomorrow. The schedule is available online, although there have been some minor changes. I’m planning to blog some bits and pieces of it, so stay tuned for that. So, its been an interesting few weeks. My Wings lost, and I had a very pleasant discussion about it with Derek. I finished the first 2 of 4 qualifying exams for my department. Two more in October, then an oral, then hello dissertation proposal! After finishing those two exams, I've been taking care of my son full-time. Anyone who has done such a thing knows that it is simultaneously immensely enjoyable, rewarding, and tiring. I've got a huge back-log of book reviews to write for various publications, and along the way I hope to post some interesting tid-bits here. So...stay tuned for that. Spring semester 2009 was a hard one for me. I took my last required seminar (on Paul Tillich, hence the recent series) as well as my first two qualifying examinations (one in ethics and one in history of doctrine). On top of that, I served as preceptor for the intro to theology course. As if this demanding schedule wasn’t enough, I ended up needing to spend my afternoons at home taking care of my son (which I loved, though it took a lot of time away from work) and – even worse – I spent about half the semester under the weather with one illness after another.